Hillsborough was, at its birth, an Anglican enclave in a dissenter district. Perhaps as part of a plan to reassert Church of England dominance in a decidedly not Church of England colony, Governor Arthur Dobbs and his minions expedited the creation of Orange County (1752). Though its original seat, its courthouse and seat of government was originally well to the west, two miles from Haw River, that quickly changed. Within two years the court and seat were relocated to what would in future be called Hillsborough. It was a rude village at the western-most reach of the west fork of the Neuse River. Why this site was selected remains a mystery as it was a terrible town site. 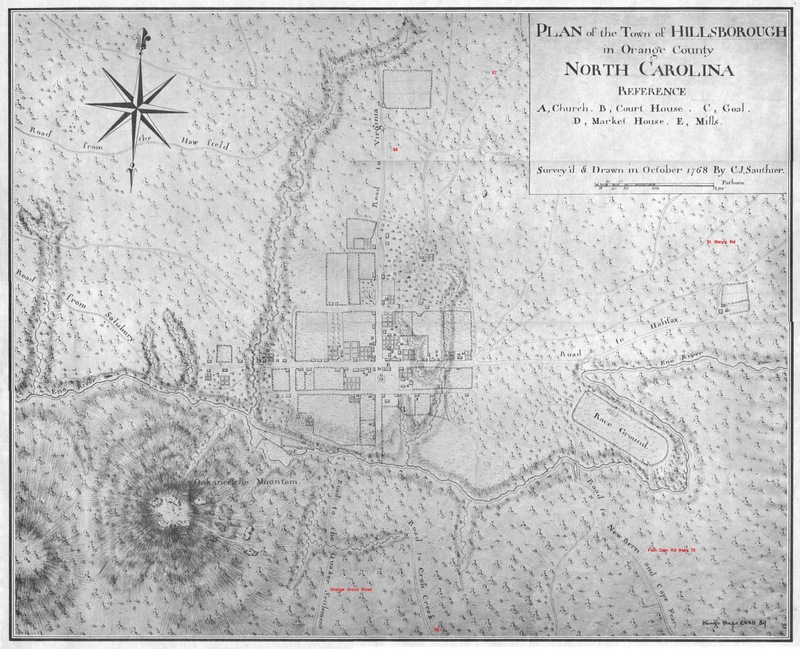 Colonial government was in the process of shifting from the Cape Fear drainage to the Neuse drainage, and that may have been the reason for locating the new county seat on the Neuse. Or, as noted, the new court town was in the center of a region dominated by Quakers and Presbyterians and conflicting land claims; it wanted proper social discipline and law. Conflict always implies opportunity, and the place that became Hillsborough, the Orange County court town attracted opportunists like humming birds to sugar-water. Judgeships and other county offices were royal prerogatives, even in the Granville District, a belt of land owned by Lord Granville not the Crown. Granville owned the land but the Crown and colonial assembly owned the law. Governor Arthur Dobbs spent his ten years as governor (1754-1764) squabbling with the colonial assembly over who controlled what and Hillsborough may be an example of one of his successes. Francis Corbin (d. 1767), a Granville land agent, and member of the Governor's Council, and a handful business associates loyal to the governor owned the land that became Hillsborough. In its early days the seat of the new county's government briefly bore his name (Corbin Town). The colonial Assembly, though, did not ratify the governor's choice until it chartered Hillsborough late in the 1760s, in the midst of the Regulation. Hillsborough was off of all but one, beaten path and its creation required a redefinition of roads in the area and, in response, all the major highways in the neighborhood developed "business" deviations to accommodate the new town. This note will deal with the roads and other colonial and precolonial artifacts on the east side of Orange's court town. On the east side of town one channel of the King's Highway (St. Marys Road) made its way to the northeast toward Petersburg by way of Flat River's (East Fork of the Neuse) lower fords, and another crossed the fords near the forks of the Flat (Highway 57). Another road went a bit north of east, crossing the Eno twice and went on toward Norfolk and Edenton by way of Halifax, and yet another made its way to Edenton by way of lower fords, probably via modern Louisburg, NC (by way of Fishdam on the Neuse). All but one of these routes deviated from their normal straight line courses to serve the new court town. These routes likely replicated earlier, Native American footpaths because before the great bend in the Eno attracted a courthouse or so much as a glimmer in an Englishman's eye it drew Native people to some small but decent corn bottoms in an excellent defensive position, in the oxbow east of the great bend. The paths that became horse trails and then wagon roads originally were not directed toward what later became the town but, rather, vectored in on the villages in the oxbow east of the town seat. Once the governor's Anglican enclave started asserting the governor's will in the backwater that was Orange County, locals as locals are wont to do, resisted the change. The Orange County seat was surrounded by Quakers, dissenters not at all dear to the governor's heart and certainly not friendly to Royal impositions. New Anglican parishes (for example, Saint Mary's and Saint Matthews) demanded the County Sheriff collect their allotted tithes, taxes for the support of churches most of which did not exist except on paper even though all knew there was very little specie (cash) available (it was still pretty much a barter economy). The Sheriff demanded payment in specie and confiscated draft animals in lieu of same. Dobbs' business partners and the court town's elites had cash enough to buy distressed properties and influence enough to see that the Sheriff did not relent in his collections. The "Court Party", Anglicans and their minions, controlled all important county offices, and reasonable requests and complaints from distressed citizens fell on deaf ears. Eventually, by the 1760s, ten years into the town's life, an insurrection arose, the Regulation. The court and its opportunistic hangers-on were targets of the Regulation. Though Governor Dobbs had passed on, his replacement, cut from the same bolt of cloth, came to town in 1768 to awe the peasants and subdue the unruly. Having "shown the flag" and promised some relief to the farmers, the governor left town but not before his engineering officer, J. Sauthier drew a map. 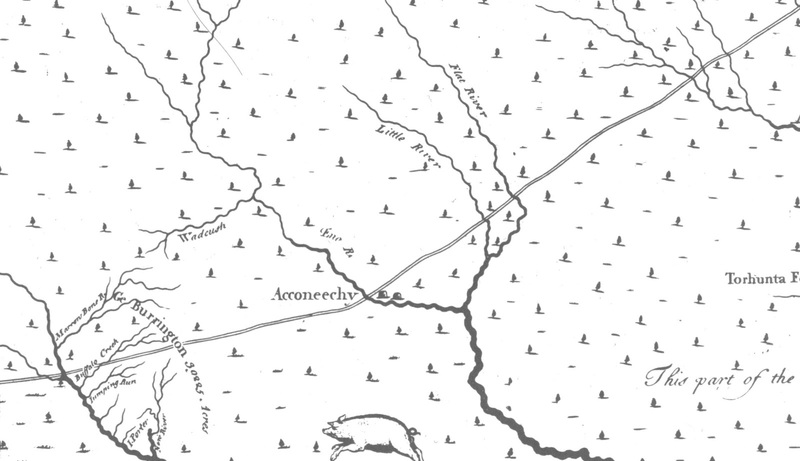 The Sauthier map tells us what the town looked like one generation after its founding. Later, In 1771, Governor Tryon returned to finish daunting Regulators and hung a handful of insurrectionists east of town. Their execution took place within a few paces of the town's new Anglican church seat, between the Trading Path and the Halifax Road, on a knoll conspicuous to all travelers. We assume the town didn't change much between Sauthier's map and the Revolutionary War, and it probably didn't change all that much between the Revolutionary War and the War Between the States. It grew a bit to the westward in the late 19th and early 20th century, but the "historic district", the lands drawn by Sauthier didn't change too much. The Town Commons on the northwest edge of town was closed and turned into building lots, for example, but land east of town remained pretty much as Sauthier saw it well past the mid-point of the 20th century. 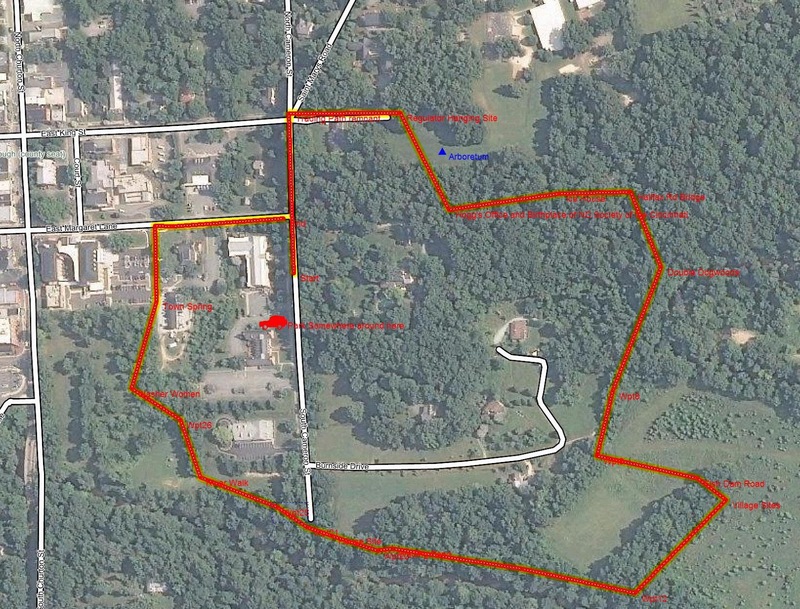 The Cameron family of Stagville and Farintosh and Cameron Arena fame bought the knoll south of the Anglican church, made an arboretum around the Regulator hanging site and put an ice house down near the Halifax road. But their estate development hastened the disappearance of humbler structures near by. By the middle of the 20th century there were fewer houses east of town than there were when Sauthier made his map. For example, along the Halifax Road extension that once ran into the Indian Fields, where the villages once stood, there are boxwood pairs marking a couple of dwelling sites. The east side of Hillsborough is sort of protected now. It is mostly in the hands of conservators of one kind or another. But there is still the threat that government will destroy what time has shielded and caution is a necessary watchword. Enjoy the remnants of Hillsborough's not so romantic origins while they persist. On Sunday, November 25th we will hike around the east edge of Historic Hillsborough. Sorry I missed the hike, but the essay is most welome.